Player’s around the globe know Yamaha’s baritone saxophones for their outstanding sound. Yamaha has refreshed the traditional image of these instruments with powerful, yet delicate tone and exceptional playability. Their strong clear sound, and excellent playability have set new standards in professional model saxophones. 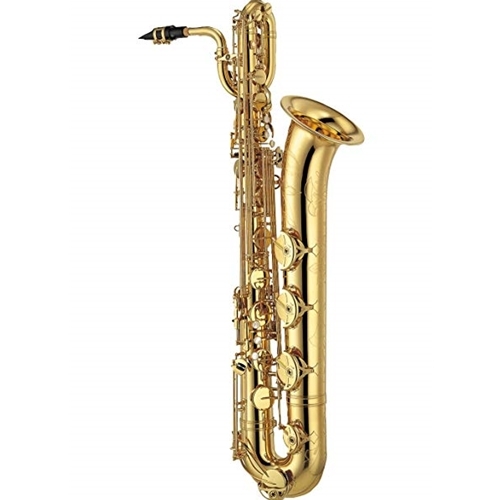 In addition the 62 series saxes offer extremely accurate intonation and a comfortable response. The YBS-62 features gold epoxy lacquer finish on body and keys, an engraved bell, and mother of pearl key buttons. The bell, bow and body provide better response and tone color through the annealing process. A front F key, high F# key, and custom style Bb spatula facilitate technique and alternate fingerings. uperior intonation is provided by refined tone hole dimensions and placement.